Our quality & innovation made us most trusted mobile app development company using agile development strategies to create a perfect android, iPhone/iPad application of your various business requirements. Enaviya is the one of leading mobile application Development Company in India. We have a professional team that is well-experienced in making mobile applications in latest technology. Our mobile app developers use low-risk mobile development methodology, cost-effective that has a proven success record and ensures rapid results and 100% visibility. Android Mobile Apps Development Services: We provide android apps development solutions to enterprises across the globe and help transform your business through Android app solutions in terms of functionality, quality, and aesthetics to creating more business scope. iPhone/iPad Mobile Apps Development Services: Our in-depth knowledge of mobile application development process and specialize in developing innovative and robust iPhone / iPad applications to diversified business verticals. Windows Mobile Apps Development Services: We designed and developed Windows mobile applications and have always been known for delivering unmatched mobile solutions. 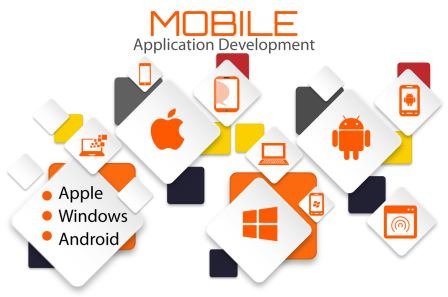 Windows Mobile application developers are experienced in porting / migrating Windows Mobile apps to other platforms. BlackBerry Mobile Apps Development Services: Enaviya's impressive team of BlackBerry App developers serve the businesses with a range of solutions which are designed to optimize the profitability. The apps are efficient and flexible thereby ensuring that the customers get the precise service features. Custom Enterprise Mobile Apps Development Services: We have expertise in developing custom multi-device mobile applications which are robust, secured, easy to navigate and cost effective. Our enterprise mobile applications are designed to save effort, time and money and help to improve business acumen through comprehensive and customized mobile applications. Enaviya provides a comprehensive list of services with customized applications for BlackBerry, iPhone and various Android powered devices. Provides up-to-date, dynamic and cost effective app development services based on technology trends which are designed to suit every kind of customer demands. Offers capable solutions which can be optimised as per the customer's requirement.